This guest post is by Alex Wubbels, RN. Back in late July, I was arrested for following my hospital’s policy and protecting an unconscious patient who could not consent to a blood draw. I was wrongfully seized by force in the middle of the emergency department. Even though my story made national news, most do not. Did you hear about the emergency department nurse who was stabbed by a patient in Massachusetts? Or the Arkansas nurse who was pushed down a flight of stairs? Or the two nurses in Illinois who were taken hostage (one of whom was beaten and raped)? Sadly, the list goes on and on. With one out of every four nurses reporting that they’ve been assaulted at work, you’ve either experienced this personally or know a colleague who has been abused. 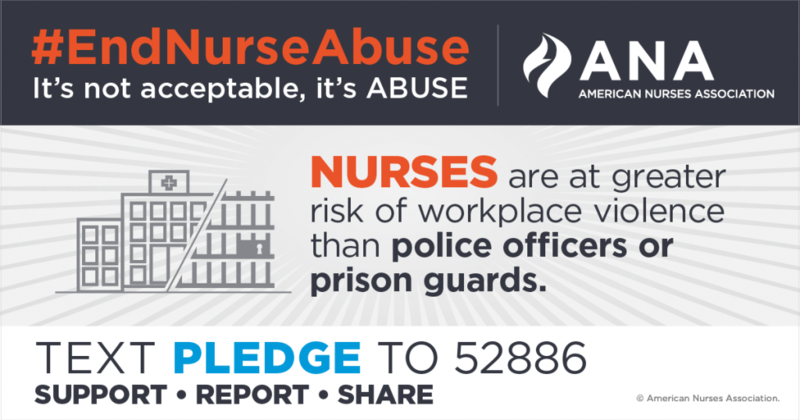 The fact that we are more likely to experience violence on the job than prison guards or police officers is unacceptable, and we must work together to #EndNurseAbuse. As an ANA member, I was fortunate to have the support of my organization, community, and a tribe of fellow nurses during this difficult time. I truly believe that what happened to me can lead to positive change in our profession. That’s why I decided to speak out: to stop this abuse from happening to others. I’ve teamed up with ANA to ask you to sign our pledge and stop this culture of violence. I am committed to this goal so we are not put in situations where we have to fear for our safety, or have to choose between our jobs and our licenses. By adding your name, you’re saying you support zero tolerance when it comes to violence against nurses; that you’ll report abuse whenever you safely can; and that you’ll share with others asking them to sign too. Please join me by adding your name and taking the pledge. I will pledge but nurse bullying by hospital management is just as real and although the association has addressed it still continues daily for many nurses regardless of what department. Thanks for commenting, Marilyn! ANA will be launching a number of initiatives around bullying and workplace violence this year that we hope will address what you’re describing. Please stay tuned for more information.